When I first started working on Growling Grass Frogs, I thought of them as the tough guy of the Victorian frog fauna. I already knew them to be a big, voracious predator that would happily scoff just about anything that would fit into their mouths (including each other). But I also thought of them as ‘tough’ in an ecological sense. They seemed pretty general in their habitat requirements, I’d read reports of them being master dispersers, and I presumed them to be long-lived and super fecund. But after a decade of working on Growlers, I’m starting to wise up to the fact that they aren’t so tough after all. Living hard and dying young: If by some quirk of reincarnation you wake up as a Growler tomorrow, don’t be too concerned, because it’s not going to last very long. Despite being one of the largest frogs to grace our good state, it appears that Growlers might be one of the shortest lived. Growler tads metamorphose quickly, taking around 2-3 months to complete the journey. And that’s some journey physiologically – we’re talking growing from a 5 mm grey wriggler to a 110 mm monster taddy, before growing lungs, sprouting legs and losing a tail in the space of a few weeks. And they don’t slow down once they’re out of the water – they hit the ground running, as it were. I once marked a Growler shortly after it metamorphosed and recaptured it at adult size 54 days later. That’s some seriously fast growth by anyone’s measure! With this rapid growth comes early maturation. It appears that most Growlers are able to reproduce in the first breeding season after the one in which they metamorphosed. I’ve recorded this for males, and observed females to reach the required body size within that time frame. It’s just as well they mature so rapidly, because most Growlers are probably dead before their first birthday roles around. Using mark-recapture data collected across northern Melbourne, I’ve estimated that survival rates across a single breeding season may be 13% or lower. Habitat specificity: As I said, Growlers are superficially quite general in their habitat requirements. They turn up in a raft of wetlands; from slow-flowing sections of streams, to artificial lakes, old quarries and storm-water wetlands. What’s more, they can often be found in some pretty horrible spots. But the thing is, just because you find a few Growlers in a particular wetland doesn’t mean they are breeding there, nor does it suggest they can persist there for long. Growlers are highly aquatic, and do best in wetlands that permanent or semi-permanent. But they need more than just long hydroperiods – they require diverse aquatic vegetation, and are sensitive to high turbidity, low water temperatures, water pollution and fish predation. When Growler’s turn up at ephemeral wetlands that have recently filled, it’s probably not because they’ve been hunkering down under a rock waiting for the rain (as many of the other resident frogs are likely to have done), it’s because a few have scooted over from a neighbouring wetland that supported a population during the dry. The same is true of Growlers you might find in storm-water wetlands and the like – in many cases I’d bet my bottom dollar that these frogs came from a neighbouring, high quality wetland rather than the putrefying, trolley-ridden waters that ripple before you. Relatively poor dispersal capabilities: From the last point, you might be thinking that Growlers are indeed quite the vagabond, roaming widely in search of new opportunities. But my experience is that only a small proportion of Growlers move about, and that the distances these frogs travel are relatively small. During my PhD I marked ~800 Growlers across 19 wetlands in northern Melbourne. Of the 131 that I recaptured, the longest recorded dispersal distance was only 430 m, and the majority stayed pretty close to the spot where I first found them. Now I acknowledge that inferring dispersal rates from mark-recapture has its problems, but this concurs with our occupancy and genetic data. Both suggest that populations separated by more than about 1 km have relatively little interaction with each other. This contrasts markedly with some of the frogs with which Growlers co-occur. Take the Brown Tree Frog and the Common Froglet. Recent genetic work to the east of Melbourne has shown that populations of these frogs display considerable gene flow even when separated by distances of 8 km. It’s quite embarrassing really – here are a couple of frogs that aren’t even half the size of your average Growler, and yet they apparently give Growlers a hiding on the dispersal front. Clearly, these traits haven’t driven Growlers into decline on their own – the species was abundant historically, and I many of these traits are hard-wired. Instead, these traits represent frailties in the Growler’s ability to cope with the environmental conditions we have thrust upon. My view is that the occurrence of Growlers was probably always quite dynamic at a regional scale. Individual populations would go through booms and busts; the busts would result from wetland drying, changes in wetland condition, or stochastic events that jointly killed off adults and tads, and the booms from colonisation of wetlands that recently filled, or became suitable for some other reason (changes in veg structure etc.). Given enough wetlands in close proximity, and some spatial asynchrony in the local conditions, these systems would have been pretty robust. But the spatial and temporal dependence inherent to such systems (called ‘metapopulations’) gives them an Achilles heel when it comes to human-induced environmental change. Put simply, metapopulations are doubly sensitive to habitat loss, degradation and fragmentation. In the first instance these processes reduce metapopulation size and connectivity, which increases the likelihood that all populations will simultaneously go bust by chance. However, habitat loss and degradation also reduces the diversity of patch conditions, which increases the chance of synchronous local extinctions during widespread perturbations (like drought). It’s no coincidence, in my view, that Growlers disappeared very rapidly from many places across their former range when two big environmental perturbations coalesced in the late 1970s: a severe drought that affected much of south-eastern Australia, and the importation of the renowned frog-killing fungus, Batrachochytrium dendrobatidis. For years we’d being setting Growlers up for a fall through wetland destruction, degradation and fragmentation, and they fell hard when drought and disease arrived in tandem. So what does this all mean for the conservation of Growlers in contemporary landscapes? For me, it highlights just how important wetland density, diversity and connectivity are for the persistence of this species. It remains commonplace, sadly, for the wetlands upon which this species relies to be destroyed or degraded to make way for urban and agricultural development. Moreover, we continue to isolate wetlands by placing roads and other major barriers between them. History suggests that there is only so much of this that Growlers can withstand. If we don’t learn this lesson soon, we’ll just keep setting the poor old Growler up for a fall, and fall it will when the next perturbation comes along. Hale, J.M., 2010. Human-induced changes in the population genetic structure of frogs in south-eastern Australia. PhD thesis. University of Melbourne, Melbourne. Hamer A. J., Lane S. J. & Mahony M. J. (2010) Using probabilistic models to investigate the disappearance of a widespread frog-species complex in high-altitude regions of south-eastern Australia. Animal Conservation 13, 275-85. Heard, G.W., Scroggie, M.P., and Malone, B.S. (2012). Classical metapopulation theory as a useful paradigm for the conservation of an endangered amphibian. Biological Conservation 148, 156–166. 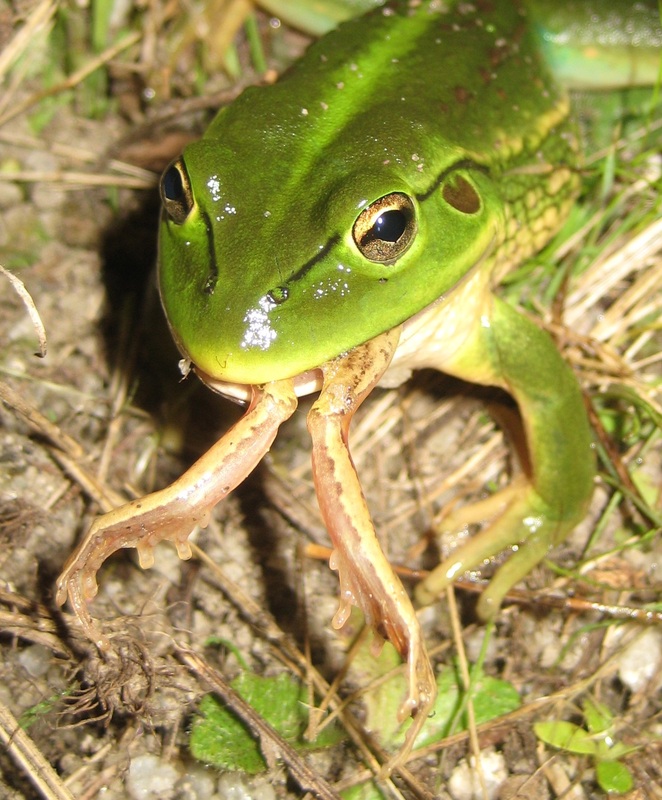 This entry was posted in Growler ecology/conservation and tagged amphibian, applied ecology, frog, growling grass frog, habitat fragmentation, herpetology, metapopulation, model, population viability, urban. Bookmark the permalink.